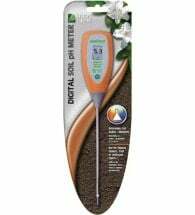 The Rapitest pH Meter instantly measures how acidic or alkaline your soil is. 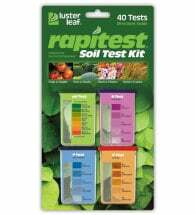 Includes pH preferences for over 400 fruits, vegetables, grasses and landscape plants. Batteries NOT required. 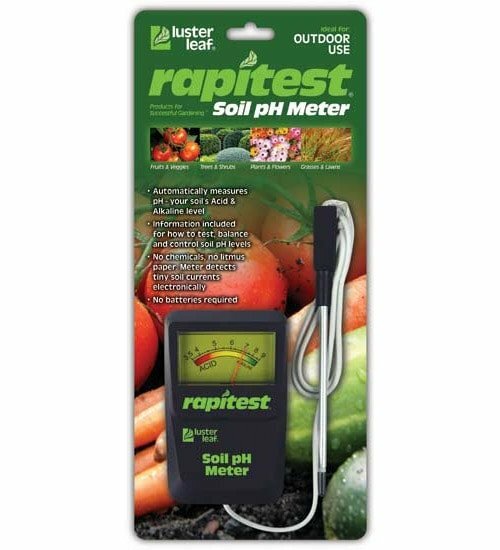 Plants need the correct pH (acidity/ alkalinity) level which controls how well they utilize the nutrients available in your soil. All plants have a pH preference, so it is important to know what this measurement is. You can then choose plants with the same pH preferences, avoid those that will not do well in your soil, or know how to go about supplying their special growing needs. 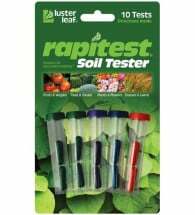 By testing your soil, you determine its condition so that you can adjust it more effectively and economically. 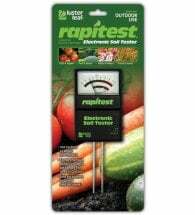 Step 1: Simply push probe into moist soil. Step 2: The unit will register pH levels on a scale of 3.5 – 9.0. Step 3: Check readings against the provided list of pH preferences to find those plants which best suit your garden. Step 4: Should you decide to grow a plant which is not suitable for your existing garden soil condition, complete details on how you can alter the soil are included.